On An Overgrown Path: Aldeburgh - is the problem celebrity new music? Aldeburgh - is the problem celebrity new music? An article in the Telegraph questions whether Pierre-Laurent Aimard is the right man to run the Aldeburgh Festival. Michael White's thrust that we should "leave running English music festivals to English music-lovers" is plainly wrong, but the underlying question as to whether all is well at Aldeburgh is valid. Regular readers will know Snape Maltings is my local hall. I spend more time there than in any other venue and have written more about music at Aldeburgh than any subject over the last seven years. My experience is that truly exciting and innovative things are happening at Aldeburgh; but increasingly they are happening outside the Festival period. Over the last twelve months three of my most intense musical experiences have been at Snape, the Aldeburgh Young Musicians performance of Louis Andriessen's Workers Union, John Cage's Song Books with Exaudi (see photo above), and the Suffolk Youth Orchestra's interpretation of Rachmaninov's Second Symphony. Not one was a Festival performance (although Exaudi are Festival regulars), and not one involved a celebrity performer. In a 2007 interview Aldeburgh's chief executive Jonathan Reekie told me "Aldeburgh has always been about the new". But has it always been about the new performed by celebrity musicians such as Pierre-Laurent Aimard and Simon Rattle? These and the other high profile names that increasingly appear on Aldeburgh Festival programmes are undoubtedly artists of the highest calibre. But inevitably their itinerant lifestyles and record company contracts impose very specific constraints on the Festival programmes and performances. 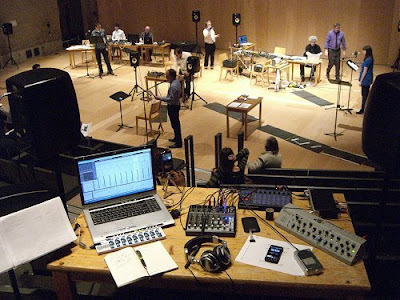 Which when overlaid with the requirements of Festival "partners" such as BBC Radio 3, which made the Aldeburgh Festival one of their "properties" this year, things start to become rather uncomfortable. Yes, there is a real danger of the Aldeburgh Festval becoming a musical Guggenheim, a designer museum of contemporary music. But Michael White's solution of winding the clock back and appointing an English-leaning artistic director is clearly errant nonsense. Instead the incredibly talented in-house team at Snape should start winding the clock forward, because the celebrity-led music festival is fast approaching its sell-by date. The Aldeburgh Festval does not need to wrap new (or old) music up in a celebrity package to attract audiences. Of course, high-profile artists should be part of the Festival, but not its raison d'être. Quite miraculous things happen at Snape for fifty weeks a year without a jet set artistic director and the Aldeburgh Festival need only look to its East Anglian cousin the Britten Sinfonia to see what can be done without a celebrity figurehead. * Just to show I am impartial here is a link to my podcast pre-concert talk with Pierre-Laurent Aimard. Interestingly I open by talking about Benjamin Britten and the Aldeburgh Festival before discussing the music of Elliott Carter with Aimard. Header photo is (c) On An Overgrown Path 2011. Report broken links, missing images and errors to - overgrownpath at hotmail dot co dot uk Also on Facebook and Twitter.